Our newest quilt book. It's at the printer now and all the proofing and corrections have been made. It should be done in a couple of weeks....just in time for market. This one has quilts, food and other fun projects. My friend and editor, Edie McGinnis and I went to Spring Green, Wisconsin right before last Christmas. We stayed above Country Sampler (quilt and cross stitch shop) in their Second Story. Click on the shop name to check it out. We cooked the recipes for the book in the kitchen and worked on quilts in the very large, open and gathering room. You can see the areas in the photographs when you visit her site. I photographed the food in a window well on top of a cutting board. (Great light!) Jeanne Horton, owner of Country Sampler has a great shop. Staying upstairs of the shop has its advantages. If you run out of something, you can go downstairs and make a fabric run in your slippers! Pink Hill Manor is the newest in the Anniversaries of the Heart series. It is at the printer too ...and should be ready to ship out this week. Barb did this one and I think it is my favorite so far. Love the colors. Cathy Campbell from Primitive Traditions sent these two sweet quilting templates to us. She was staying in Cape Cod and found them. Usually, I'm a Baptist Fan person when it comes to quilting.....but I have to say I can hardly wait to use one of these! Aren't they sweet. (Click on Primitive Traditions to go to Cathy's site.) I've been checking out her Eliza Robertson. Love the saying and think I have to stitch this one! Well....have to make this short....Barb and I are working on the fabric line and we have to get it sent to Moda. I've got 6 of these sample packs of Garden Party fabrics. Leave a comment and will do the random number generator and pick 6 winners Thursday morning. Now Pink Hill Manor I do like! :) It's really pretty - April is our anniversary month and I can see this as an anniversary sampler :) Thanks for previewing Alma and thanks to both of you for another great design! Thanks for another beautiful cross-stitch design and a beautiful quilt book - I do both and will probably purchase both patterns. I love everything you create! Can hardly wait to add Pink Hill Manor to the collection. Stitiching this series on one piece of 40-ct linen. I love everything in your pictures. Can't wait for the shops to get your new things! I am so excited for both new publications and a new line of fabric. I am still working on the trick or treat quilt. I guess I better get busy! As a quilter and a cross stitcher, I can see that your new book and Pink Hill Manor both need to be in my future! I am always amazed and delighted at your beautiful designs. Please add my name in the chance to win the pretty fabric. Thank you! Such Lovely designs.. Your pictures are always inspiring. I love the Pink Hill Manor... haven't done a stitchery in quite some time, this one might be it! Oh my gosh!! Everything is fabulous. I can't wait to get my hands on all of it. Deep breath, deep breath. Please enter my name in the drawing--yeehaw! Thanks! Pink Hill Manor is gorgeous! I'm so glad I decided to collect this series for stitching! Love your creativity when you photograph your special pieces. Can't wait to stitch the new Anniversary house. I love that Pink Hill Manor. That will be a must have! Please enter me in your drawing. Thanks! I love Pink Hill Manor. I am stitching the houses on one piece of fabric and I know it will be beautiful when done. Your newest book and pattern look wonderful. I'll look forward to seeing them in person. The fabric is lovely. I'm a baptist fan gal too but those templates look like fun to try. I visited Country Sampler last summer and hope to get back there again soon. Of course I bought some of your patterns there! I can hardly wait for the new quilt book, and I'm on an auto-ship for the cross stitch. You two are so talented, and we are glad that you share with all of us. Would love to win the fabric pack. Wow, what great stuff to come! I love the cover of the new book, just beautiful. Pink Hill Manor is really pretty too! Can't wait to see your new books. That sampler in the pink looks yummy. Beautiful fabrics too! Thanks for the preview Alma! Can't wait till they hit the shops. The book looks great! I'll have to keep an eye out for that...I hope I'll be able to get it here in the UK. Pink Hill Manor is a lovely design...tempting!!! Lucky you to stay above a fabric store, would be fun shopping and creating in my slippers! I would love to be included in the drawing for the fabric and I can't wait to get my hands on your new quilting book! Thanks for the previews. Congratulations on your new publications and new fabrics too! I don't think there is a quilt book of yours that I don't have to drool over! 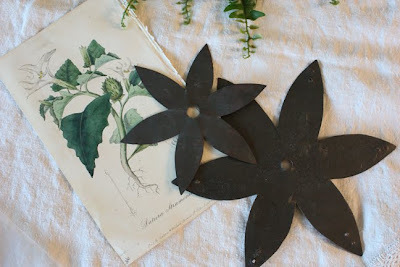 Thanks for the mention of the Primitive Traditions website. 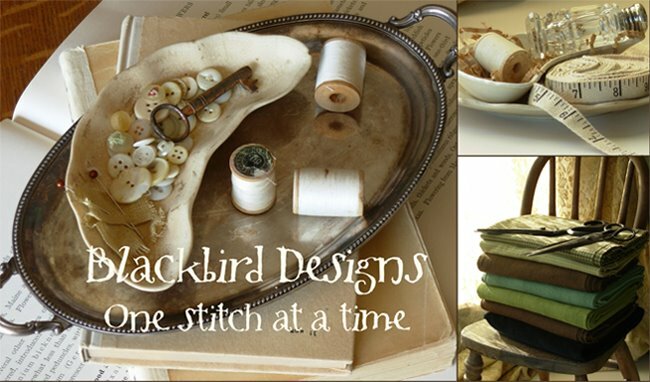 As a stitcher and a lover of primitive I was happy to find a new website. LOVE the fabric and Pink Hill Manor too. The new quilt book looks lovely, as always. And Pink Hill Manor is so pretty and springy. You are such talented women! Another wonderful design - I love Pink Hill Manor! Thanks for all the wonderful pictures. I can't wait to get my hands on Pink Hill and the new quilt book! Please enter me into your drawing. I can't get enough of your patterns or fabrics. Love the peek at the new pattern and the new book! Can't wait til they are available. I love Country Sampler & Spring Green and am already counting the days until Boxwood & Berries! Great new design!Beautiful! Please add my name in the draw. Thanks for hosting a great giveaway! I love checking out your beautiful blog! The embroidery is gorgeous. I can't wait to see the new book. The colors of the quilt on the front cover are soft and gorgeous. Happy Book Publishing! Absolutely LOVE the vintage feel of your newest patterns and fabric designs. Your work always takes me to a quiet place of days gone by....thanks for sharing your multiplicity of talents with us. Now, I would LOVE to collect Pink Hill manor, but since finding your blog, I've ventured off to your quilts (after a 7 year hiatus in quilting), even though and I'm two years behind with Loose Feathers' club too! Talk about a wealth of choice! I'm trying very hard to resist, but it may be fruitless! Thanks so much for your wonderful inspirations! I love the quilt on the cover of the new book. I'll look for the book when it comes out. Everything you do is beautiful. I absolutely love Pink Hill Manor! It won't be long and my Blackbird wall will have to expand to two, or three....or the whole house! After all, when I look at my stash of patterns the Blackbird ones out number all the others. Thanks for the giveaway opportunity. I would be honored to be one of your winners. What a nice colors in Pink Hill Manor! 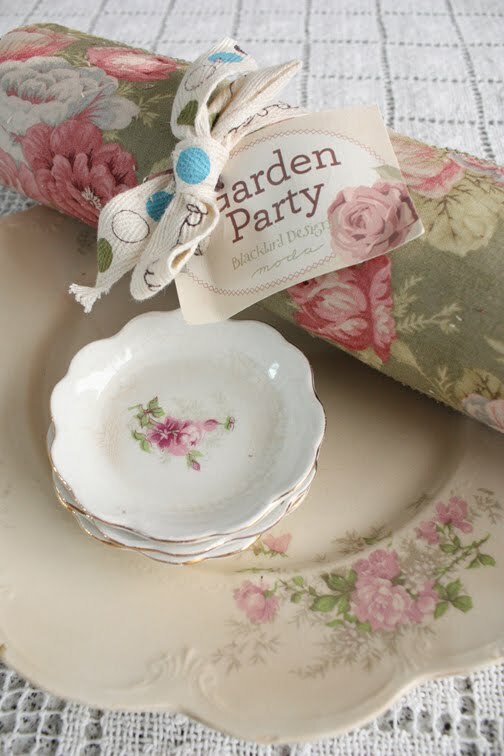 Just love the Garden Party fabrics, so please enter me in the drawing! I'm looking forward to the new fabric line! The book and the fabrics are gorgeous! All kinds of ideas are flying around in my head - can't wait to see the projects you have created and try the recipes, too. Your creativity is astounding!Thanks for sharing so much with us. So great news! new quilt book, new pattern and beautiful fabric! Let the inspiration will always be with you! I love Pink Hill Manor. You girls are so talented. Oh the new quilt book looks fabulous! And I think I see your little radishes in the photo too!! The new AOTH is beautiful as well - so pretty. The new design - the new fabric - Love Both! Please add my name to your to your drawing and thank you! Oooh can't wait!! These look gorgeous. I think I need a special room for my Blackbird Designs stuff, though books and patterns will definitely outweigh the projects I've completed. How you manage to get all these ideas, make them up and produce these beautiful books and patterns is wonderful. What a talent and gift. Ooooo, pretty! Your book looks awesome; I will definitely have to take a look at it when I find a copy somewhere. Your new book looks wonderful and I love the new house! Beautiful as always! Oh my isn't Garden Party just fabulous! PICK ME! I so love everything you ladies design! Thank you for always brightening my day with lovely things to look at! Love it! I'm still working on something from your other book! I'm ready to win any fabric from you guys, it's all great! OMG--I love Pink Hill Manor! My grand daughters will love this one--Pink is their favorite color! Need to get my material so I can start on my houses!!!!!! I'm anxious to see what's inside your new quilt book. Thanks for sharing; you are very generous and I do so appreciate it. What beautiful designs and colors! Looking forward to the newest cross stitch designs. Ooooohhh! I needed some new inspiration! I could do with some of that lovely fabric too - count me in for the lucky draw!! I love the colors in your new fabrics! Wow, a new book of my favorite quilt ladies!!!! Count me I for the lovely countest. "Pink Hill Manor" is wonderful! The colors are so sweet...ZAnd your new book looks so "yummy"! Congratulations to Barb and you! I'm so excited to see the cover of the new book. I can't wait to get it in my hands and also love the Pink Hill Manor. I'm still trying to decide on doing them all on one piece of fabric! We just found out that we are moving to Kansas in August. We will be near Wichita at McConnell AFB. I've done told Cherie (Ralston) that I will be finally getting to go to Primitives of the Midwest, since it will be so close. I'm so excited. Pink Hill Manor is so beautiful! I love the Garden Party fabric. It's so soft and gentle. But don't you know we only have 24 hours a day : How can I do everything ???? You are too tempting !!! Oh my such goodness! Love the look of the new book! Will have to have it! The cross stitch design is lovely also. can't wait to receive he new anniversay pattern and , even if I'm not a patworker, I'll buy your new patchwork book just because i love to see pictures you have done and deaming a bit. thanks again for this new chance. Looking forward to the new Country Inn book. Thanks for all your beautiful designs and fabrics. Thanks so much for sharing your talents with us. Can't wait for Pink Hill Manor I have them all so far.I just would love to have that fabric!! 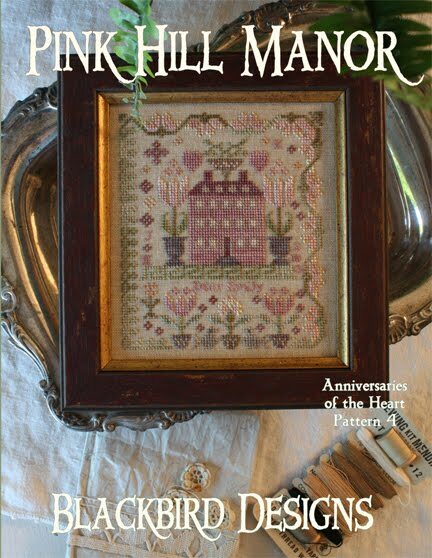 I can't wait for Pink Hill Manor to be available...I look forward to stitching it, as I enjoy stitching ALL your designs...please enter me in the drawing, thank you! Love the pink sampler and Garden Party fabric. I can't wait until it is in the stores. Please enter me in your drawing, and thanks for the opportunity to win. Love that Pink Hill Manor! What a beauty! And the quilting templates are lovely. That was so thoughtful. Count me in for the beautiful fabric! I always have room for stitching and sewing stash! new PINK Hill Manor is beautiful!!! Pink HIll Manor- lovely love all that pink. Your new quilt books looks like it will be great - I like the idea of adding recipes. Love Pink Manor Hill! Looking forward to the book. Your blog is very inspiring, too. Congratulations on your newest book - it must be a thrill to actually see it all finished and ready for print - like bundling up your baby! And how cool would that be to vist a shop in your jammies and slippers to get the extra piece of fabric that you forgot you needed - what a great place that must have been to stay at! PS - The fabric is so pretty! Btw.. any tip on how to do the corner with hte ruffle??? Hello, your country Inn Book looks just wonderfull I am sure I will at that one to my booklist:-) You 2 make really gorgeous things. Love your designs, itś all beautiful. Love Ellen W from the Netherlands. Good luck to you with all things to come! Your new book, pattern and fabric look wonderful! Looking forward to seeing them in person. I'd love to win the fabric, just like everyone else! Thanks for the opportunity! Congratulations on your newest quilt book. Pink Manor is fabulous too! Thanks for the giveaway. Enjoy your blog and pictures are beautiful. Can't wait to see the book and new house pattern. Love everything you do. I feel at peace when I visit whether at work or at home. Can't wait to see your new book in person. It is amazing all the you two get done. Can't wait to get the quilt book!!! Please enter me in drawing to win the fabric? Thanks! Please add my name to win the fabric. It is so nice to see so many new projects ! I love the new pink house of the Anniversaries serie ! I am waiting for it !!! Thank you for your beautiful work ! The fabric is beautiful. And I can't wait until the new x-stitch pattern is at my LNS. Please count me in your drawing. I'd love to be considered in your fabric giveaway...thanks! Are you kidding me!! Oh my..would totally love to win this. I am loving Pink Hill Manor!! Love the new Pink Hill Manor chart. And can't wait to see the new fabric line!!! I love Pink Hill Manor! I think it's my favorite so far, but I love the other three as well. What a wonderful series! Love all the new stuff! Thanks for sharing it with us today. I love all your new designs. They're gorgeous. The new fabric line looks beautiful, too. Oh goody! A new book! I just love having them to look at!!! I've already got the date book for next year - A MUST for everyone!!! Thanks and can't wait for the new pattern and quilt book. Your designs are fantastic, I love all of them. Cannot wait to see the new book!! I would love to win some of your new fabrics! Please enter my name for the draw. My email is in my profile. Thanks! Oh I just love your fabric! Thanks for the giveaway! I can hardly wait each day to check for your blog update . . . let alone wait for the new books to arrive! Thanks for sharing all your creativity with all of us! The new book looks wonderful! Already on my list of next purchases.Thank you for the wonderful inspirations! Pink Hill Manor is so lovely design's ! and thanks for the winner of these so cute Moda fabrics ! I love everything you create. A big hugh from Erica Kok from Holland. Love the new Anniversary design - the pink house is wonderful- there is an awesome restaurant in Savannah housed in a historic home called the Olde Pink House - I'll have to stitch this one in honor! A chance to win to win fabric. So many new projects to stitch. Better grab my book on tape and my stitching. Someone else can make dinner tonight. I can hardly wait each morning to check your blog for updates. . . and now I have wait for the new books! Thank you for sharing your wonderful talents and creativity with the world! I can not wait to get the new items and I can have my own Garden Party! Yes, Pink Hill Manor is fantastic. I have just started quilting & would love one of your fabric bundles. Can't wait to see your new book. How fun to stay the the Country Sampler and prepare all your recipes right there. They have such a great website and wonderful presentation of their wares & being able to shop in your slippers is always a good thing. I LOVE Garden Party. I can hardly wait to see the entire line. Pink Hill Manor is so sweet - I'd love to stitch it on 40 count for my granddaughter. Thanks for all the wonderful designs - inspirational!! Please enter my name in your drawing. I can't wait to get started on your new Anniversaries of the Heart design! Thank you for the preview! Always enjoy your blog entries. Please enter me for the draw! I can't wait to see your new fabric, but some of this would hold me over! i really like Pink Hill Manor ... seriously thinking about doing them all on one fabric ... they are great! I was at the Stitchville retreat where we used the PVA glue by Paper Source. I found out that Minneapolis has a Paper Source store uptown. Visited there last Saturday and bought a jar of the glue to attach the top piece to the lid. Just have to put my initial on it and the stitching is done! Thank you for the wonderful retreat classes!!! didn't mean to be anonymous. it's me Elaine! Just not blog-savvy. As usual, you are awesome! I look forward to seeing all your newsest designs! Can't wait! I'd love to join the garden party and win one of such lovely fabric!!! "Anniversaries" is moving right along! Thanks for offering a fun fabric giveaway; please include me in the draw! Beautiful! All of it! Thank you for sharing your talents with us! Never disappointed with anything from Blackbird Designs. Both are just stunning. Please enter me for the giveaway! Oh that Oink Hill Manor is lovely! I can't wait to see the new fabbies that you guys are coming out with! Thanks for the sneak peek! I can almost picture a garden party with these lucious colors....you girls are so blessed with talent! Your new fabric line looks gorgeous -- just like everything you do! Barb and Alma, you continue to keep me inspired!!! I am working as fast as I can to keep up with you and be ready to start projects from both books as soon as possible! Thanks for all that you do. Love the Country Inn photo and Pink Hill Manor has my name written all over it. Pink Hill Manor looks like another great cross stitch design! The quilt book looks really nice, too, but I still prefer cross stitch. Guess I still haven't mastered the use of my new sewing machine. I could use the fabric for cross stitch backing with pinkeeps, etc. though so please include me in the drawing. Thanks for the giveaway. 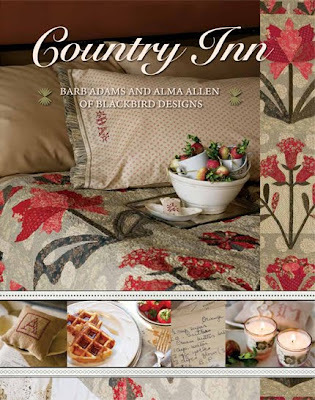 I can't wait to get my copy of Country Inn to make a new quilt for the guest bedroom! I can't wait to see your new book. It looks wonderful! Can't wait to get my hands on your newest book, Country Inn. Please enter me in your drawing...the fabrics are beautiful! I love Pink Hill Manor - am SO stitching that. Thanks for the give-away! OOO the book, the pattern just so much eye candy. I wonder how long we have to wait before they arrive in NZ - soon I hope! Then there's the fabric - be still my beating heart. Tankyou Alma for teasing us. Yum! It looks like a lovely book - can't wait! The little peeks are driving me nuts - eek. Wow, as usual I love your new cross stitch pattern and look forward to seeing your quilt book. You are my favorite designers. I can't wait for the new fabric line. Can't wait to see all the new quilts! Your new books looks so interesting. The fabric is beautiful. I can't wait!! LOVE the fabric! Please add my name. Beautiful colors in the book cover and the pattern. I've been quilting now for 3 years, but your wonderful sampler pattern is calling for me to find the cross stitch supplies again!! Thanks for a chance to win FABRIC !! Oh my Alma please add me as I would love Garden Party!!! Love your designs but need more stitching quilting time!!! Your designs are delightful and so are your fabrics!!! i hardly ever win- maybe this will be my lucky time! You are so generous to be offering the Pink Hill Manor fabric pac and the book looks wonderful also. Please add my name in the chance to win the pretty fabric. thanks for the chance to be the lucky one.! Love the fabric Alma. I hope I win one!!!! Looking forward to the new quilting book too. I'd love to add your new book to my collection. As usual I love the designs. I can't wait to own the new books. Great Job! I loved the Country Sampler's second story - what a neat idea! I always love your fabulous give-aways and can't wait to see your new fabric line! Thanks for sharing. The fabric is lovely! And Pink Hill Manor is my favorite of the series (that is out so far). You adies are so talented. Thanks! I love the new cross stitch design. April is my birthday month - can I make it a whole month now I'm so old???? Just wondering was all. Love love love the fabric but then again I always do. You guys can get the blame for my starting to quilt because I love your fabrics so much and didn't just want to use them on pinkeeps etc. All your designs are so beautiful! I would love a chance to win the fabric! I love ALL of the new patterns - they are up to the usual high standard of course!! Thanks for the picture of Pink Hill Manor! I'm stitching this series on one piece of fabric and can't wait for the latest installment. Would love to have the fabric, so please enter me in the drawing. Oh, yum! The new book looks delicious in every way! Can't wait for the new book. I've stayed at the Second Story in Spring Green....lovely! What more could you ask for? Sleeping under quilts above a quilt shop!!! Heaven. Pink Hill Manor is lovely!! I can´t wait to get it.I love this fabric too. Please enter my name and thank you so much for the chance. The new line, Garden Party is fabulous- love the newest chart. I have the fabric and will have the chart lined up ready for my summer break from teaching!